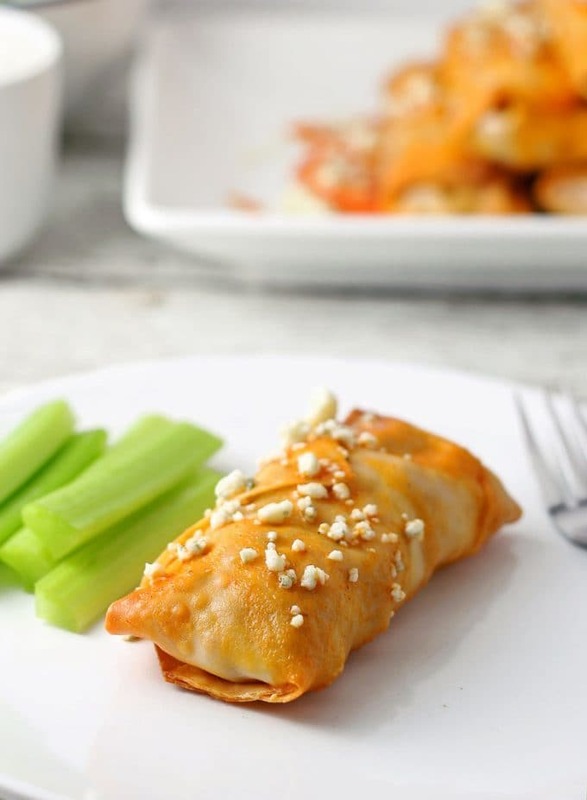 These baked buffalo chicken egg rolls are great as an appetizer or lunch! 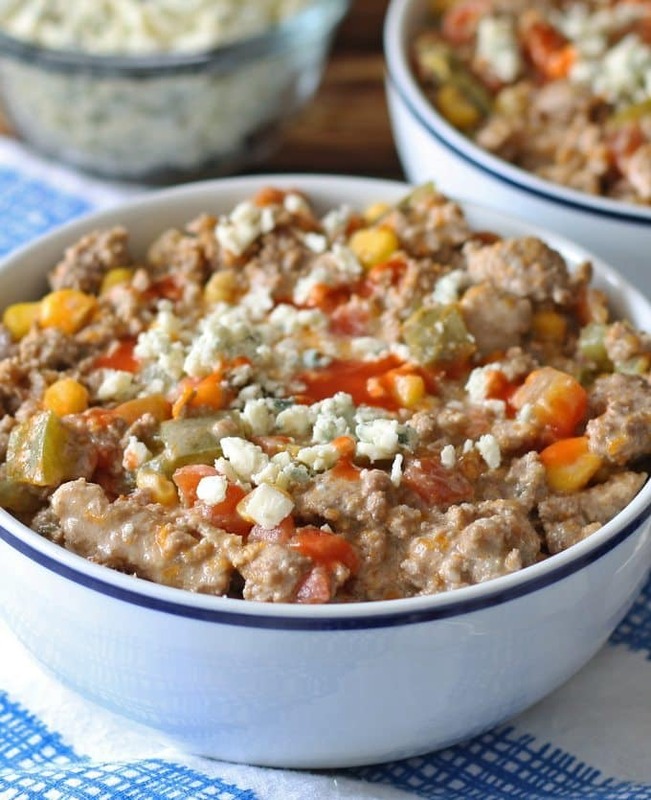 Serve them with blue cheese dressing and extra buffalo sauce! I’m pretty sure I have mentioned before that I used to work in a restaurant. It was a pretty decent living but I was so, so bored. That’s actually one of the reasons I started this blog – it was my escape from the daily doldrums of slinging plates and taking food and drink orders. The restaurant that I worked at closed in February – don’t worry, I’m not going to get all nostalgic on you. Well, maybe just a little. If you work in a restaurant for any length of time, you probably did what I did – eat everything on the menu over and over again. By the end of my “restaurant residency”, there were only 6 dishes on that menu that I could eat on a regular basis. I’ve decided to make my way through those 6 dishes here, creating my version of the recipes since I can never order them again. One of my favorites were their fried egg rolls stuffed with chicken and buffalo sauce. I try not to fry food in my house and I can’t really eat fried food at restaurants so I decided to make baked buffalo chicken egg rolls at home. Why not cut calories wherever you can, right? That statement is especially true when you are filling the egg rolls with lots of buffalo sauce and blue cheese crumbles. Both of those things top my list of “Favorite Foods to Put on Everything” and I couldn’t resist filling these babies up. 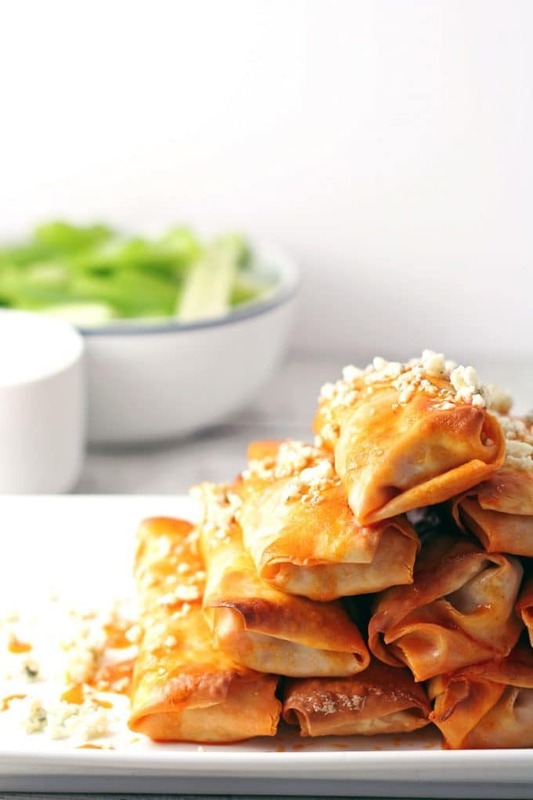 After the egg rolls are done baking, serve them with sides of additional buffalo sauce and some blue cheese crumbles drizzled on top. Ramekins of ranch and blue cheese dressing and a few celery sticks don’t hurt either. I like to drizzle the buffalo sauce all over the top of the eggs rolls, then dip it into more buffalo sauce followed by blue cheese dressing. I can’t help but make it gluttonous I guess, whether I fry it or bake it. 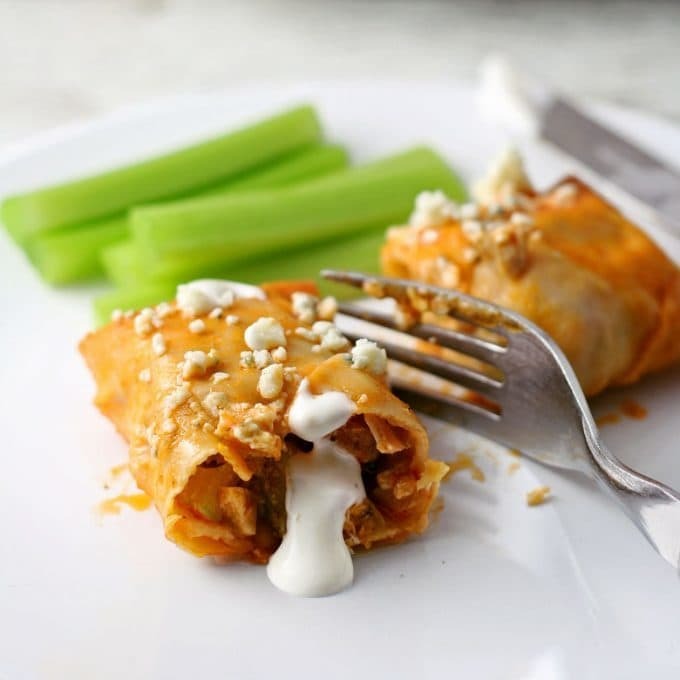 If you love buffalo chicken egg rolls but want to attempt to eat healthier, this fun appetizer recipe is the next one you should try! 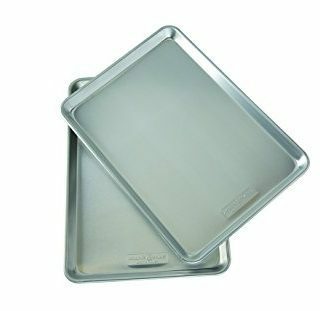 Preheat oven to 400 degrees F. Line a baking sheet with parchment paper. 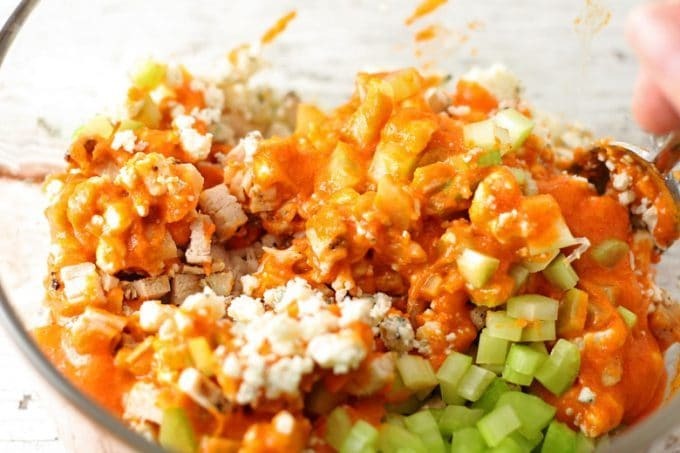 In a small bowl, combine the chicken, celery, blue cheese crumbles and buffalo sauce. 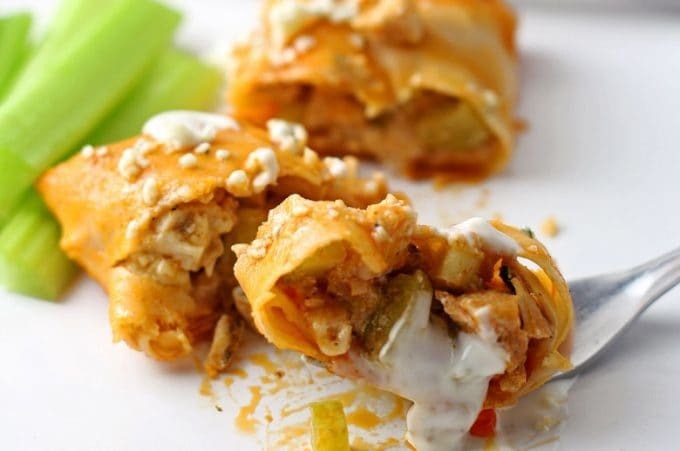 Assemble the buffalo rolls. Position an egg roll wrapper like a diamond. In the middle of the wrapper, place 2 tablespoons of the chicken mixture. Fold the bottom corner up, then fold the two sides towards the center. 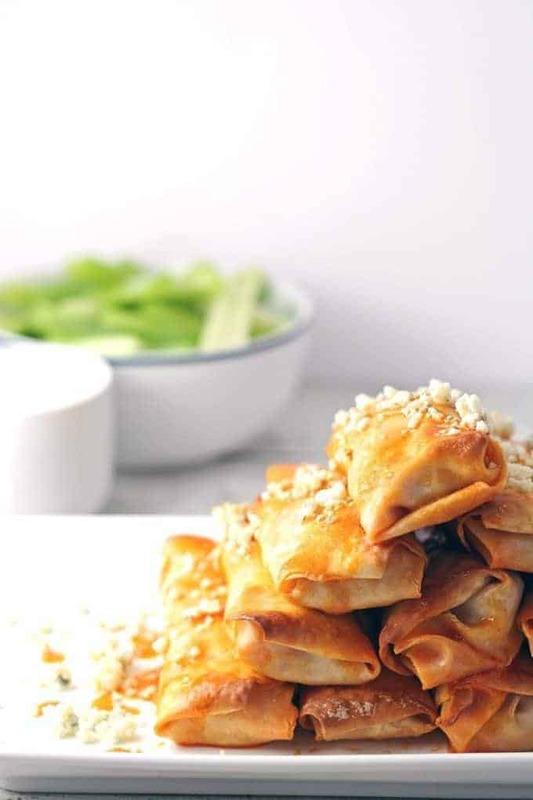 Brush water on the top corner and the folded sides, then roll to close the egg roll. Repeat until all egg rolls are rolled. 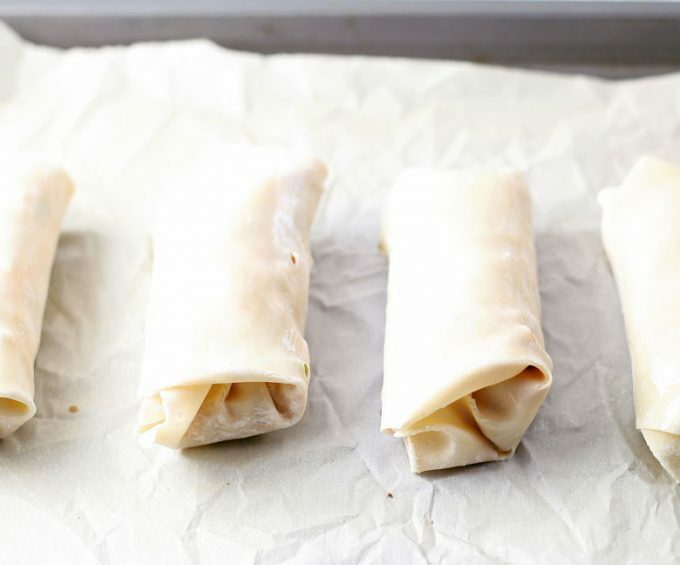 Place egg rolls on baking sheet, spaced evenly apart. Brush the tops with oil. Bake for 10-12 minutes. Looking for more baked appetizers? Try these baked chicken wings! Nah yum, these sound like just the sort of thing I’d enjoy on a picnic. They seem pretty addictive too. Laura, they are so addictive!! Thanks Elaine, I hope you love them as much as me! 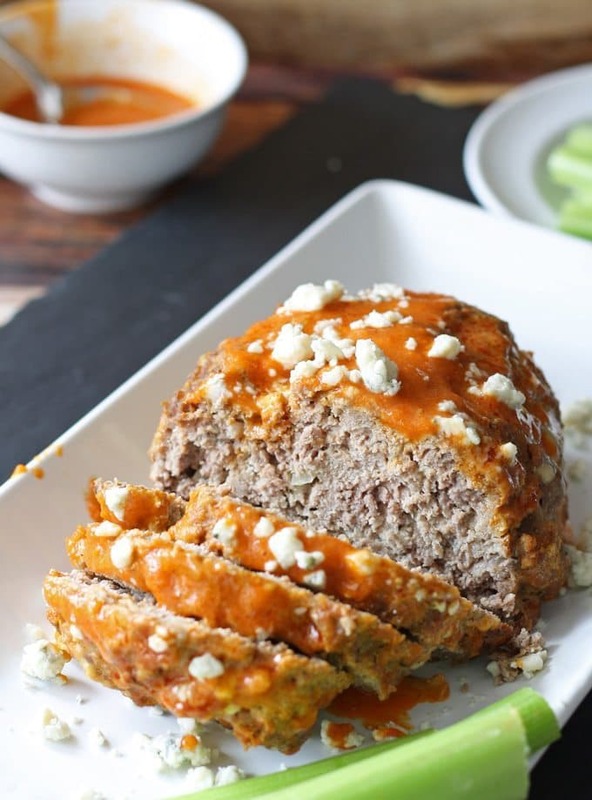 I have to agree with you…blue cheese and buffalo sauce are two things I could slather all over just about everything. These look amazing, Jenny! Can I come over for appetizers?! You can come over anytime! I love that the egg rolls have an unexpected flavor. 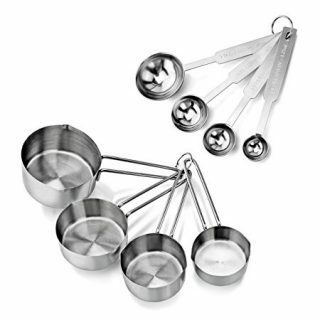 I am digging these because they are a great way to serve those famous flavors! 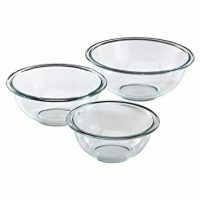 Everyone is bringing buffalo chicken dip, but these come with the added bonus of not having to worry about people double dipping in the bowl! Thanks for linking up to #SaucySaturdays! Oh my, these look incredible. Im pretty sure that Im going to crave nothing but these for the rest of the day! These are so clever! Love how expertly you folded those egg rolls! Thanks for sharing with #SaucySaturdays! What a neat recipe! Such a cool party dish! Yum! These need to make an appearance at our next party! Thanks for sharing! Yum! My kiddos are going to love these! I wonder how the recipe would be if I used soft tortillas? I can’t waitto give them a try! Dropping in from Create IT Thursday, so happy I clicked your link! Thanks for sharing the recipe! I am hooked on anything buffalo chicken! These look so delicious, I will be trying this recipe out FOR SURE. I’ve included your post in my Five on Friday roundup! Thank you for including my recipe Emily!! 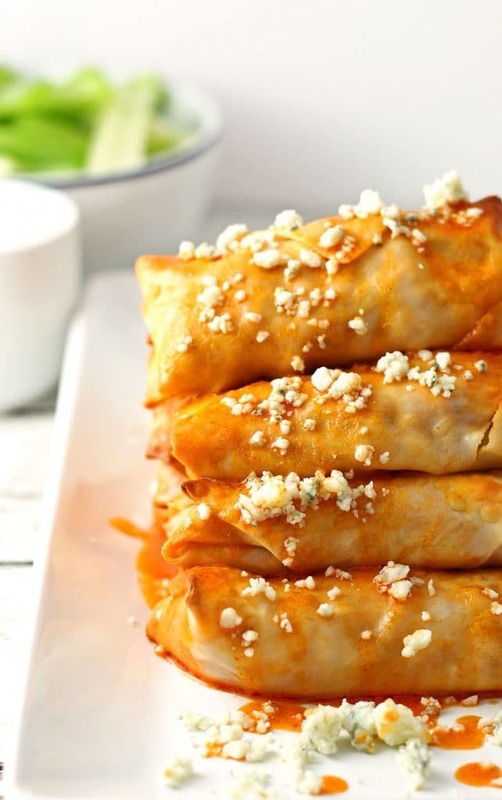 I love buffalo chicken, these egg rolls sound amazing! Thanks for sharing at What’d You Do This Weekend?! DELISH!!!! I bet the filling would even taste fab on a salad! Thanks for sharing at the Let’s Get Real Link Party! Pinned! It took me a long time to try it, but then buffalo became one of my favorite flavors! I love buffalo chicken ANYTHING! Thanks for sharing at Merry Monday, and can’t wait to see what you link up this week! Awesome Megan!! Can’t wait to see it! Thank you. I wish that this was my dinner versus leftover pasta! 🙂 Wondeful food photos…looks delicious! Prettiest egg roll I’ve ever seen Jenny! Would love a stack of these for my next party! Whoa … these beauts definitely make my #trainerapproved list. All those flavor combos on one plate done in a (ginormously) healthier way. Score! And thanks for the process shots, you super-simplified what looks complicated. Ah…. Fusion at it’s best!! Great idea! Thanks for sharing on the What’s for Dinner link up and don’t forget to leave a comment at the party – Next weeks features that also leave a comment get pinned and tweeted! These look so good! I love anything with buffalo sauce but too try to avoid anything that’s fried. Visiting from Tasty Tuesdays. Pinned the recipe. My husband would love these. I will have to make them for him. Thanks for sharing with us at Family Joy Blog Link Up Party this week. Hope to see you next week! These look sooooooo tasty – especially as a Buffalo girl myself, these sound done the right way! 🙂 Thanks for sharing at #HappinessIsHomemade this week! 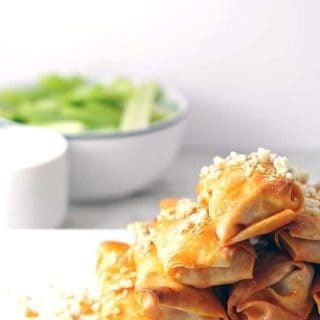 This is one of my most requested appetizers and I always bake mine. Thanks for sharing with us at Throwback Thursday. Hope to see you again this Thursday at 7:00pm est, Pinned! These look great! Thanks for sharing your recipe at Craft Frenzy Friday on Mom Home Guide. Pinning this!